Eliezer (Elie) Dobrin has been studying the violin since he was five years old and has been teaching private violin lessons since 2010. Growing up in a musical family, Elie was constantly surrounded by musical understanding, education, and passion. His father is an orchestra conductor and his mother is a private violin and viola teacher, so it was only natural for Elie to follow in his family’s footsteps, taking in all that he had learned from both parents and applying it to his teaching. Elie’s professional training began in high school, as he attended the Booker T. Washington High School for the Performing and Visual Arts in Dallas, TX, graduating in 2008. He then went on to study music at the University of North Texas, receiving a Bachelor of Arts in Music in 2013. 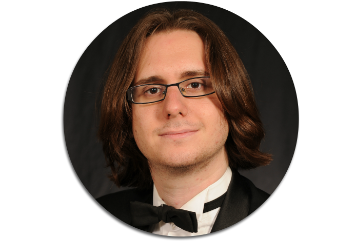 Elie then went even further and graduated from Stephen F. Austin State University with a Master of Music degree in Orchestral Conducting in 2016. Elie began privately teaching violin while working on his undergraduate degree, using all that he had learned and observed through his extensive music education. He continued to teach as much and as often as possible, but then moved on to more of a group setting as the assistant conductor of the Piney Woods Youth Orchestra during his graduate studies. Working with young musicians and showing them how to both do their best all the while enjoying and finding passion in their music has always been Elie’s life goal. He hopes to achieve it through his teaching philosophies, believing that, in order for a student to achieve musical excellence, they first must find it within themselves to want to do so in the first place. Elie works with each student to find exactly what it will take to ignite that musical spark, and believes that every student is vastly different and requires different kinds of encouragement.